Government is committed to halving poverty by 2014. One way of achieving this is through its social grants programme. Social grants help people to get out of the poverty trap and to cope with the rising cost of living. But how do you apply for a grant if you don't have official identity documents? In the past, some people couldn't get social grants because they struggled to get identity documents or birth certificates. This often left them in a desperate situation and unable to feed their families. Because government is committed to helping everyone in need, a lack of official documents is no longer a reason not to get a social grant. If you qualify for a social grant and have difficulty to get official documents, you can go ahead and apply for a grant without it. But before you can do so, you will have to make a sworn statement, called an "affidavit", before a commissioner of oaths. You will find a commissioner of oaths at any police station or magistrate's court in your area. In the sworn statement you will have to give evidence before the commissioner about your personal information or those of children involved in the application. This includes names, ages, dates of birth, parents or any other information that may be relevant to the application. When you have made the statement, it will be sent to the Department of Social Development. As soon as they receive it, they will start processing your application. The new system was first started to help people who had difficulty with getting child support grants. But it has now been extended to include all types of grants. 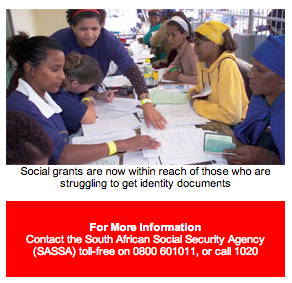 This means people who struggle to get identity documents can also use the new procedure to access other grants. These include care dependency, foster care, old age, disability, and war veterans grants, as well as the grant in aid and social relief of distress grant. The new process will make it easier for the Department of Social Development to join hands with the Department of Home Affairs. Together they will speed up their services to people without official documents.